So I was out in Australia for 9 days for work so obviously no 40k for me. I was sad to miss the tournament (that makes two in a row due to work travel), but such is life. The good news when I got back in the office I was greeted with this for me: So that's exciting. Even though this is my 4th army almost every other army was bought mostly second hand with a small spattering of new stuff. This is the first time I've ever had that much new stuff sitting on my workbench. Of course the downside is that is a lot of work. Plus I have 1ksons on the bench that still need painting. I'm taking the better part of two weeks off at the end of the year so I should be able to get some work done. Of course I could end up playing some (fingers crossed) and there are multiple family holiday events so who knows how much time I really get to spend building up the army. That's a lot since the 1ksons take forever to paint. At the very least I'd like to get the 1ksons painted (base coats and all the blue highlights) and then mounted on the painted bases. Then I'd like to get the hulls of the vehicles, cut, deflashed and assembled. Getting all the magnet work done will take more time which I'll work on in Jan. If I can get all that done I could actually put a whole army on a table without having to pull out proxies which would be nice (though I'm still borrowing that one squad from Liam). 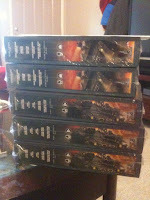 Then I can finish up painting the 8 sons in Jan, do the magnet work, and start painting up the tanks. We'll see how it goes, but either way I'm excited to get it going again!